My 2018 New Year’s resolutions were in full swing by the first week of January. I remember listing my big hairy audacious goals in my notebook on New Year’s Day, sipping a cappuccino while sitting in my garden. I went to bed that night confident nothing was going to stop me from achieving my goals. But by the end of the month, the chronic fatigue that I have suffered from on and off the past decade raised its ugly head. I felt debilitating head pain and exhaustion. I couldn’t work my usual long hours or on weekends, and I needed to sleep in the middle of the day — something I would never normally do! I couldn’t concentrate for more than an hour at a time. I couldn’t talk to people on the phone or in person. I don’t know how I got through client meetings without losing my composure. I would cry at the end of each day because I wanted to do so much, but my body could not. I had never felt so out of control. By early March, my fatigue was at its peak. I felt like I was going to die. I sent an urgent email to my brother, who is a lawyer, asking him to update my will in case I died on the train going home from work. My goals were stopped in their tracks. It seemed I would never be able to launch my Money Intelligence® online courses or fulfil my life’s mission to raise people’s Money Intelligence®. I realised I couldn’t keep up my usual 10 to 12-hour days. I had to give my body what it needed: more sleep, time out, a chance to stop thinking about the future and to be present in the moment. In the midst of my despair, something else was at play. I became obsessed with growing succulents. I couldn’t get enough of them! I used pot after pot to grow my succulents and decorate my garden. 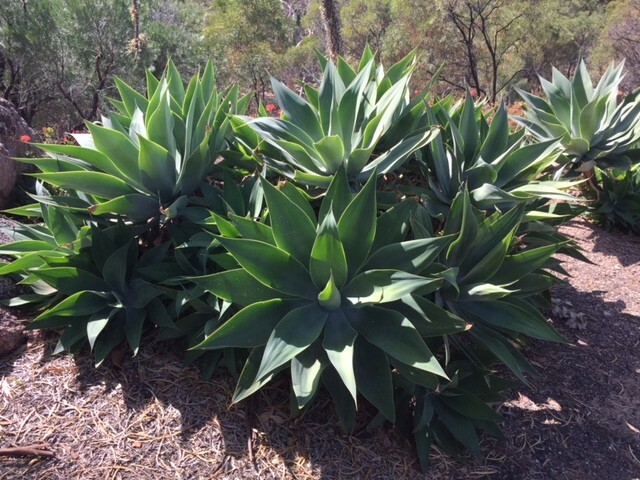 Wherever I went, I would look for succulents: at Bunnings, in neighbours’ gardens, at a farm in Mudgee during an Easter getaway! I have been growing succulents for five months now. Every weekend, I go into the garden and plant at least one. I’m not a gardening person — my husband is. All the years we’ve been together, I have left the gardening to him. But now, we compete for garden space. We even had a mini fight about how much space he would give me for my succulents! To my surprise, growing succulents has contributed to my healing process. While planting and replanting, I have been able to observe nature. Immersing my hands in the soil and growing these plants has grounded me. I feel something my body was not attuned to before. These plants have taught me big life lessons that I would like to share with you in the hope they might help you (or someone you know) in your struggle to deal with your human condition (whatever it is). We are not only part of this natural world. We are this natural world. We are organic matter. We are as strong and resilient as those plants. They withstand the sun and heat, the cold and the rain, and they still survive, bloom and reproduce. The plant doesn’t think, “I’m not good enough,” or, “I’m scared of the sun and the rain.,” or “I keep getting moved from pot to pot. I can’t keep going”. Whatever happens, the plant opens her leaves and takes it all in, starts shooting roots to connect with the soil. We are like the plants. We are stronger than we think. We are stronger than what society wants us to believe — that we are deficient for not having enough style or success, for not having enough money or the latest brands. Our humanity is not defined by what we wear, what we drive or where we live. We are human. We are enough. We are nature. We are beauty. Plants’ reason for living is to grow, and growth needs resilience. If the plant is in the right environment, it is bound to grow and multiply. It’s part of its DNA. It’s the same with us. If we don’t grow, we die (inside as well as outside). There are plenty of dead people walking, refusing to grow wanting to stay comfortable, wanting to keep the status quo. It’s UNNATURAL. The most successful plants I’ve grown were the ones that grew more roots. Even the hardiest succulents can die if their roots are not well established. Foundation is the key and it’s the same with humans. Our quick-fix society, our culture of instant gratification and ever increasing consumer debt, our obsession with being the “fastest growing company” — all this means we grow fast outwardly before we can establish strong roots. This fast and furious way of life will catch up with us. In fact, it already has. According to Beyond Blue, suicide is the biggest killer of young Australians aged 15–24 years. And according to the World Health Organisation, more than 300 million people across the world live with depression and more than 1.3 million Australians experience depression — that’s 1 out of 16 people. Despite our economic prosperity, we are experiencing lower levels of happiness and higher levels of loneliness and depression. Britain even just appointed its first Minister for Loneliness to tackle this “sad reality of modern life”. It’s even harder for women. We have now two jobs rather than one (tell me about it! ), working harder than ever juggling home and work all in the name of independence and feminism (It’s not fair!). But we are exhausted, overworked and underappreciated. Is it really worth it? Is there a better way to solve our female human condition? (Girls, I will be sharing more about this in coming weeks!). Our consumer culture is eroding OUR VALUES. It does this not only through money and material possessions, but by stealing our time with those we love. It demands more of our attention so we can consume mindless entertainment, driving a wedge between families and communities. To thrive as individuals living within the organism of family, business and government, we need to establish OUR ROOTS. We need to create a vision bigger than ourselves rather than drift on this earthly ship without a compass. We also need to take time out to relax, read poetry, listen to music or do nothing. We need to connect with friends and family, plant trees (and succulents! ), say NO to high-maintenance clients and walk away from deals that compromise our integrity. We need to sleep in on Sunday morning, go for a walk without our phones, visit a place of worship, surf at the beach, take the kids fishing, set up a communal veggie garden, visit old people and help those less fortunate. By connecting to our most basic human needs of love, connection, contribution and fulfilment, we grow stronger roots. The result is a strong, resilient human being that can withstand the elements, then take the next step to grow so we feel alive. Feeling alive is the best gift we have been given. So, feel your feelings and fulfil your mission in the short life you have been gifted. By the way, I am much better now. I have to watch myself not to overwork. And I developed a bad habit of sleeping in on the weekend! Susan is the author of the transformational and practical book Money Intelligence®. Susan is passionate about helping people achieve financial liberation. She truly believes that people can become financially liberated by developing a healthy relationship with money. Buy the book in either printed copy or ebook and learn more about being money intelligent on shopify.